Our online Thomas The Tank web site has been created due to hard work and dedication. To find out how the Thomas The Tank Engine and Friends shop got started, read the story below. Hi my name is Steve. 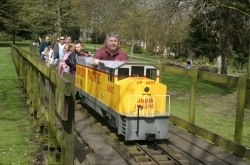 In 1999 my wife Rita and I took over what was a run down and closed miniature railway in the park in Chester. 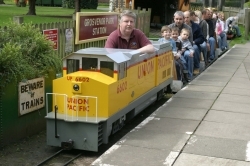 The railway had closed in September the previous year and did not reopen until Whitsun weekend when we took over. We had an infastructure but no locomotive to run with. Luckily I was able to purchase a second hand diesel locomotive and we were up and running again. The green diesel was not always the most reilable diesel in the world and did break down a few times in the first couple of years, but it got us started and we were able to purchase a new class 47 diesel at the end of 2001. (The red diesel in the pictures on our web site). 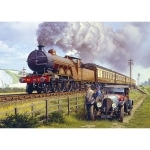 At the time it was much needed as our passenger numbers had been growing all the time. Things move on at a pace and we were able to buy two big new locomotives in 2004 the Union Pacific diesel and a blue "Thomas II" design steam engine, which actually looks a bit like Thomas The Tank although it is called "Stevie B". 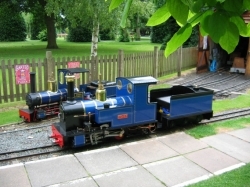 In 2006 after a major heart operation ( I had to slow down) I looked at how we could build on what we had got at the railway and the natural thing was to offer mum's a solution to their Thomas challenges. Where can I buy? I am looking for a ? Do you know where the full size Thomas is this week? 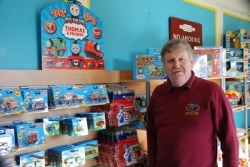 Thomas Tank Shop hopes to provide some of the solutions. 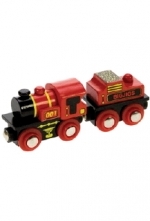 We hope you can find the latest Thomas The Tank toy for all the Thomas The Tank Engine and Friends fans. Not only are we building up one of the most comprehensive ranges of Thomas items available but we are stocking other little boys toys and we hope to provide mums and dads with information on Thomas events throughout the UK as well as information on other railways large and small that could be of interest to your little Thomas The Tank Engine fans. 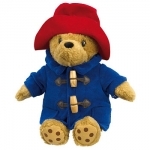 You will need to register for our enews for this, along with news of competitions and special offers from time to time. If you have any suggestions of how we can improve our shop further or are in need of help finding a product please email us on [email protected] and we will try to help.